Sephora Fall/Winter 2018 | Skincare at Sephora Malaysia - what you should expect! Last month I had a lovely afternoon with Sephora Malaysia exploring and learning about all Sephora Fall/Winter 2018. This season Sephora will be flourished with a whole bunch of new products from skincare to makeup to haircare. Some are already available now at the store and online. In the next few months, others new items will be available with as well. I know you’re a beauty addict like me. Thus I couldn’t just pass sharing forecast on Skincare at Sephora Malaysia so you know what you should expect. Start wish-listing! This homegrown Singapore skincare brand, Allies of Skin is completely new to me. The brand features a variety of skin care products formulated with antioxidants, probiotics, and nutrients. Allies of Skin products are supercharged and concentred to provide full-proof skin care. They are already available in-store and online. I’m a fan of AlphaH Liquid Gold Glycolic Acid. In my experience, this is the best glycolic acid toner (picture below) I’ve used so far. This fall this Aussie skincare brand Alpha-H got a packaging makeover. Their all products are now white and gold. Which in fact looks and feels better than the previous version. AlphaH products are renowned for their high concentrations of active ingredients. Their products are focused on visible signs of aging, sun damage, skin sensitivity. AlphaH educator gave me a good insight into their products. She made me keen on trying the Tripple Action Cleanser as we as the Liquid Gold Firming Eye Crema. I was too hard to get close to GlamGlow booth at the event so I could take some pictures. It was the Glamglow X Becca We Know Glow collection everyone was dying over! I would too maybe if I could manage to get a peek haha! I’ll definitely, with you all when it releases on the store this September. There are also a variety of new Glam Glow mud cleanser and skincare sets available at Sephora. A clinical skincare line, Kate Somerville, is formulated with highly functional active ingredients and balanced by soothing botanicals. This season Kate Somerville’s highlight product is their DermalQuench Liquid Lift. Which claims to give you an advanced wrinkle treatment at home. 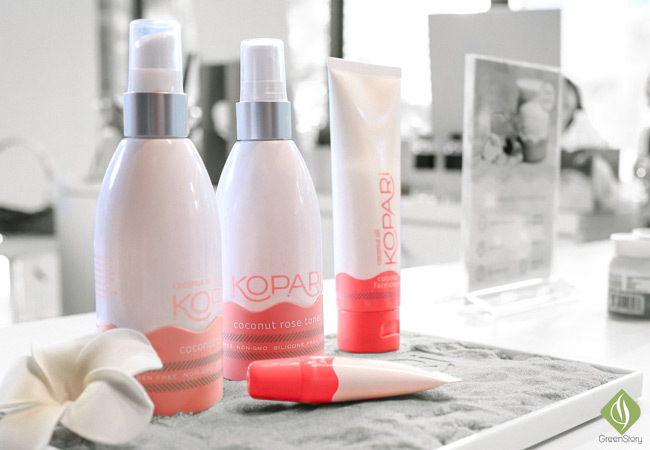 A new addition to skin care brands at Sephora, Kopari, that is all about coconut. This US brand is a wonderland for those who love coconut. Kopari is offering from a cleanser to lip balm to a multipurpose skincare melt that is a great hair mask as well. Available now at Sephora store and online. I was looking forward to seeing some new products especially their makeups. Unfortunately, Pixi Beauty yet to bring them here in Malaysia. However, I’m keeping the hope up that they will bring their full collection here at Sephora Malaysia soon. Sephora released has a vast collection of exciting skin and body care within their own collection. Each of the Sephora Collection skincare range is featuring particular natural ingredients; lemon, rose, algae etc. For your daily needs, there are a variety of skin cleansing wipes which are too cute to just pass by. Their new range of face mask is something you should have a look at. A skincare brand for your face maskin thirst. Sratskin is not your regular mask but they’re the next generation masks focused on the niche skin needs. They are offering a range of sheet masks that illuminate, smooth, purify and hydrates. You want advanced antiaging care but instant result then StarSkin Micro Filler Mask is your thing to grab. [With the demonstration at Sephora Press Event, StarSkin Micro Filler Mask gave me a feeling of Murad Hydro Glow Aqua Peel. I’m keen on giving the Micro Filler Mask a try so I know if they are anything similar]. StarSkin has also clay masks, foot and hair masks under their umbrella. I fell for This Works products already, although it is a fairly a new skincare brand to me. At Sephora press event, This Works Brand educator gifted me their Sleep Power Nap Spray hearing about my own insomnia situation. Since the first day, I’m hooked with it and also surprised the way it worked. I gotta write another post on this Power Nap Spray. Can’t describe everything here so stay connected for that. This Works In Transit Pollution Shield is another product you may want to have a look. it is a skin mist that protects and hydrate at once. Saturday Skin, a K-Beauty brand, is finally here at Sephora Malaysia. I’ve been personally waiting for them to arrive here. I mean, cant you ignore their packaging, at least? This fragrance-free brand features a range of peptides in their skincare. From moisturizer to sheet mask, everything you can find according to your need under the umbrella of Saturday Skin. The Aussie supermodel’s skincare brand, Kora Organics by Miranda Kerr, is also a new release this season at Sephora Malaysia. Kora Organics is based on everything natural and healing, yet concentrated and active. A while ago one of my readers told me that she wasn’t me to try the Noni Radiant Eye Oil, apparently, that went out of stock as soon as it launched at Sephora online. I’m waiting for it to be back in the stock so I can give it a try. I’m also looking forward to trying the cooling rose quartz thingy within my skincare to see how they really work. Dr. Jart Shake & Shoot To Go rubber mask rage and Creamidin skincare range is now available at Sephora Malaysia with its full form. Fresh Skincare introduced a powder type 30 second foaming facial, Vitamin Nectar Vitamin C Glow Powder. It’s a potent formula infused with 20% vitamin C to give the skin an instant glow and smoothness. The Vitamin Nectar Antioxidant Glow water is something you don’t want to miss checking out, especially if you are a mist lover. Also, do not forget checking out mist toners by another amazing organic brand Herbivore Botanicals. With a soothing scent, each of their toner mist is skin balancing, refreshing and healing. If you’re a beauty gadget fan then you must check this post where I talked about my experience with a new at Sephora beauty device. Missing a travel companion? Canon EOS M10 and Rilakkuma is here!